The sun shone, as it always does, on the Margam round of the British XC Mountain Bike Series. In the exclusive grounds of the very grand Margam Park we rode laps of wooded green hillside while 3 miles down the road the Port Talbot steelworks belched oblivious clouds of industrial waste up to meet the blue horizon. 30+ female riders assembled on that start line today in an unspoken contract to make each other hurt and harbouring secret desires to be better than the person stood next to them. Ugly yet beautifully simple. On the gun Scottish teammates Jessie Roberts and Kerry McPhee took the helm and set a hard pace up the initial climb. Steadily Austrailia’s Rebecca Henderson wound herself up into pole position and I jumped on her wheel. The pace softened into the singletrack climb before Bec disappeared on the first descent and was never seen again! The battle between the domestic riders however was well and truly on with Kerry McPhee holding my wheel and Alice Barnes steadily moving up. As the 1.5 hour race wore on I was concious of some changes in position happening behind me and a few silly mistakes in the rooty tree section kept my challengers in contention right up until the last lap. Coming through the start finish for the final time I thought “right, let’s see who has got what left” and engaged top gear. Unfortunately, once engaged I found it only gave me an extra 0.5%! But it was enough. More tired than I thought, I kept the tempo high and got a small gap on English Commonwealth Games rival and T-Mo Racing’s Alice Barnes. I managed to keep Alice at bay and crossed the line some 3+ minutes behind Bec Henderson with Alice taking 3rd place. My Scottish Teamate Kerry McPhee from Rock & Road taking 4th and Wales own Mel Alexander in 5th. Spinning around the beautiful grounds of Margam Park afterwards I wondered what’s it all about. This racing business is brutal, painful and ugly. It brings out the most base of human characteristics but strangely also the most pure and honest ones too. There’s something gladiatorial about putting yourself handlebar to handlebar on the start line. A fight to the metaphorical death. Once engaged in the battle you give much of yourself over to your primal survival instincts. You don’t have much control over these but you do have control over the human being that encompasses them. I have begun to realise a bike racer has more control than she thinks over how she approaches racing and training. Patience, compassion, mindfulness, unselfishness are still choices both on the field of battle and before / after the battle is over. Over the next 6 weeks in my lead up to the Commonwealth Games I’m going to try and embrace the ugly and find the beautiful within it. 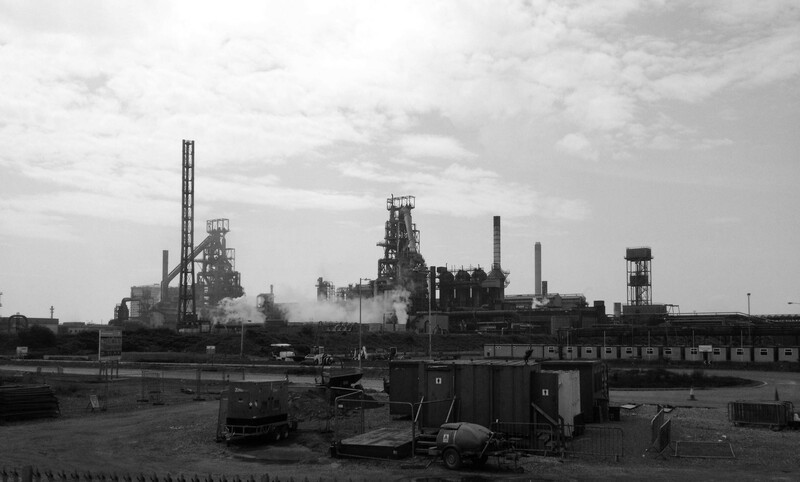 Like Port Talbot steel works. Praps I should suggest a strap line to their tourist board.